They say that whoever you are it's okay, you were born that way. Those words don't comfort Emily, because she was born Christopher and her insides know that her outsides are all wrong. They say that it gets better, be who are you and it'll be fine. For Emily, telling her parents who she really is means a therapist who insists Christopher is normal and Emily is sick. Telling her girlfriend means lectures about how God doesn't make that kind of mistake. 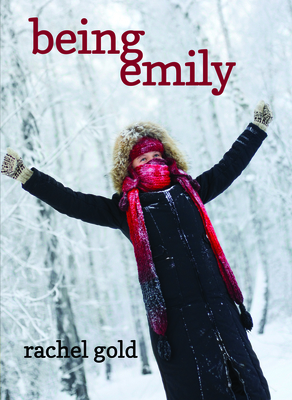 Emily desperately wants high school in her small Minnesota town to get better. She wants to be the woman she knows is inside, but it's not until a substitute therapist and a girl named Natalie come into her life that she believes she has a chance of actually Being Emily. Rachel Gold has spent seven years as a reporter, ten years in marketing, and holds a Master of Fine Arts in Writing degree. She worked as the senior reporter for a weekly newspaper with a readership of up to 100,000. She also served as a PR manager for an international technology company whose reach extended to Europe, Asia and Australia. She has appeared at the Minnesota Library Association Round Table speaking on young adult literature and lives in the Twin Cities area of Minnesota.